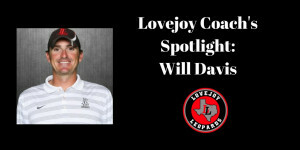 Each week the Lovejoy Athletic Department will feature the outstanding contributions from a member of our coaching staff. We appreciate the time, dedication, and the leadership that they invest in our student-athletes. This week’s Spotlight is on ­­­­­­­­­­­­­­­­­­­­Lovejoy Assistant Tennis Coach, Will Davis. What is the best part of coaching in Lovejoy? The best part of coaching is seeing the development of the athletes and impacting their futures. What is one of your most memorable moments in coaching? When we made it to the state championship against Abilene Wylie. We came up short, but the kids fought extremely hard! Who is your favorite athlete and why? Lebron James- because he is better than Jordan in my opinion. What do you like to do outside of work? Golf, Disc Golf, Tennis, Basketball, spend time with my family. What is the best part of being a coach? Impacting young student athletes every day!